Product marking: The important point is that there must be specific numbering must allow making a clear link to the relevant documentation that demonstrates the conformity of the specific type of product, in particular the declaration of conformity. Manufacture and product information: Importance is given to the numbering system and making a clear link to the relevant documentation that demonstrates the conformity of the specific type of product, in particular the declaration of conformity. Manufacture or importer marking: The manufacturer or importer must indicate their name, registered trademark and Name and address on the product. Article 6.6 (3) a single contact postal address on the product or, when not possible If lack of space, would be possible to indicate the name because of the size or physical characteristics of the product, on its and address within the product? packaging and/or on the accompanying documentation. Safety instructions: Instructions and safety information need to be provided, whether the Instructions and safety information product is intended for consumers or other end-users. The Low Voltage Directive does not make a distinction on who is the user of the product. The documentation should include all the necessary information for the safe use of the product, to enable the user to assemble, install, operate, As Low Voltage Directive covers safety matters only, store, maintain, repair, and dispose of the product. Importer: “Before placing electrical equipment on the market to keep it for 10 years after a product has been placed on the market. Article 8.2 importers shall ensure that the appropriate conformity assessment procedure has been carried out by the The importer does not have to have a copy of the technical documentation manufacturer. They shall ensure that the manufacturer has but has to ensure that the technical documentation can be made available to drawn up the technical documentation, that the electrical the competent national authority upon request. Equipment bears the CE marking and is accompanied by Even if there is no explicit obligation, the importer is advised to require the required documents, and that the manufacturer has formal assurance in writing from the manufacturer that the documents will complied with the requirements set out in Article 6(5) and be made available when requested by the surveillance authority. But the (6)” technical documentation can be given directly by the manufacturer to the surveillance authorities. What is important is that the authorities receive the How do we interpret “the market importers shall documentation and that at importer's request the manufacturer provides the ensure”? Does it mean that the importers must have a information to Member States. copy of the declaration of conformity and the Technical Documentation? What does this mean to machine builders? Basically most things concerning machinery are covered in the machinery safety directive. But in some respects the directives overlap and so the best this is to make sure that where possible electrical items in reach of the operator are low voltage and pose no risk of shock etc. There are many older but good surface grinders around these days. Many of these have obsolete control systems, this can make the machine almost worthless once the controller has failed. The PMC4 controller is now able to directly replace many of these older controllers. Things have moved on and your old machine can be made as good as a new with quite a modest budget. 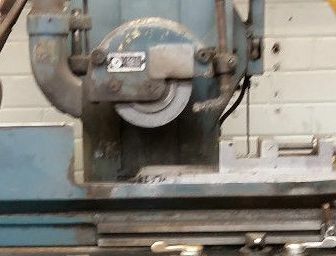 Many surface grinders have a hydraulic X axis and either a hydraulic or servo controller Y axis. Normally the hydraulic axis oscillates between two switches, but by changing the X axis hydraulic valves with a proportional valve it is possible to achieve very high accuracy and perform CNC grinding. This also makes the machine easier to operate safer and more reliable. The old valve controlled axis had a manual speed control so the controller could not change the speed of the table between course and fine cuts. The position of the table was set using switches between which the machine would oscillate. By fitting a proportional valve the controller can precisely control the table making it possible to grind patterns into the surface, not only that by reducing the speed of the axis between course in fine cuts the quality of the finished product can be improved. For those who do not want to fit the proportional valves MAP now supports oscillating axis, making it easy to upgrade old surface grinders. There are some nice new commands in MAP that make it easy to control oscillating valve controller axis like the type used on grinders. If you have an old machine we will be pleased to advise you on how to upgrade it. VIONiC™ series, a new family of ultra-high accuracy, incremental encoders. 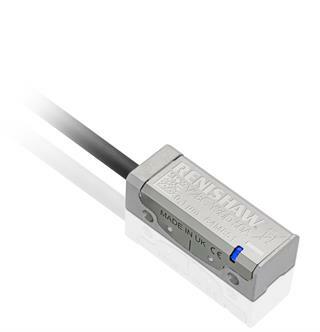 Designed for the world's most demanding motion control applications, this development brings together Renishaw's renowned filtering optics with a new custom interpolation and monitoring ASIC (Application-Specific Integrated Circuit) that enhances dynamic signal processing and improves signal stability. This achievement has allowed Renishaw to create its highest performance incremental encoder system so far, at the same time combining all necessary interpolation and digital signal processing inside the read head to eliminate the requirement for additional external interfaces. The VIONiC range has been designed to reduce overall system size to the minimum achievable for a high-performance system, whilst delivering class-leading performance in terms of cyclic error, jitter and accuracy. Customers can choose between two VIONiC read head variants. The standard VIONiC read head features a Sub-Divisional Error (SDE) of <±30 nm, a range of available resolutions from 5 µm to 20 nm, and speeds beyond 12 m/s. Alternatively for the most demanding performance requirements, customers can select VIONiCplus™ with best-in-class SDE to <±10 nm, low jitter to 1.6 nm RMS and resolutions from 100 nm down to 2.5 nm. Low SDE encoders are essential to minimise velocity ripple, which is important in constant-velocity applications such as laser scanning. VIONiC series encoders are available with the same linear and rotary (angle) scale ranges as the TONiC™ series, such that existing customers may choose to install VIONiC as a drop-in replacement. Available scale types include metal tape, spar, and rotary rings (including ultra-high accuracy REXM). All VIONiC scales come with customer selectable IN-TRAC™ reference marks embedded in the incremental channel and dual-limit switches in the case of linear scales. Welcome to the new monthly news letter from the Automation Manufacturer's Alliance (AMA). The aim of the AMA is to promote awareness of Automation issues, including benefits, safety, power saving and quality enhancements. The AMA can provide many of the components needed by a typical automation engineer including: Electronics, motors, drives, encoders and sensors to provide a "one stop shop". We are here to help and offer to try to resolve questions you might have within 72 hours. The Biomechanics team at Staffordshire University is focused on utilising biomechanics to enhance the clinical management of diabetic foot. For this purpose a novel in-vivo mechanical testing device was developed to enable the in-depth study of the biomechanical characteristics of the soft tissues of the diabetic foot. 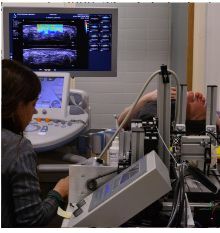 This custom device combines medical ultrasound and dynamometry to enable real-time imaging of the soft tissues of the foot during mechanical testing.